A-Ga-Ming is a Native American term meaning “on the shore”, which is easy to understand, when you consider that this signature resort is nestled near some of Northern Michigan’s most scenic shoreline. For most people, however, A-Ga-Ming could just as easily mean “on the course”. The resort is home to 72 holes of some of the area’s finest golfing, and exceptional golf is what A-Ga-Ming Golf Resort is all about. Two of the courses, including Sundance and The Torch, are conveniently located on the main resort property just off US-31, a few miles north of Elk Rapids. Both courses feature an inspired, link-style design, offering challenging, yet playable experiences. 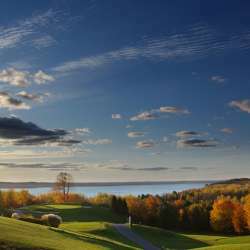 The Torch course, regarded as one of the state’s most scenic courses, offers breathtaking views of Torch Lake. Sundance, a true Northern Michigan gem, offers scenic views of Lake Michigan. Two recent additions to the A-Ga-Ming family include Antrim Dells, a popular, 18-hole course designed by Jerry Matthews, and the Charlevoix Country Club, which is receiving major upgrades, including a new clubhouse and restaurant. A-Ga-Ming’s amenities are tailored for the perfect golf getaway. “We get a lot of groups up here, including some that have been coming up here for 20 years or more” states Mike. 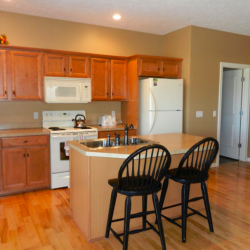 “We take really good care of them.” The resort offers several accommodation options, including one, two, three, and four-bedroom condominiums that provide groups plenty of space to be on their own and enjoy their time together. “Golf is all about camaraderie. Our accommodations promote this.” The suites feature beautiful views and have all the essentials and space for first-class entertaining. For the rare times when guests aren’t golfing, A-Ga-Ming’s location makes for easy exploring. There are several area wineries and distilleries close by. The resort is just a short drive to Traverse City, offering downtown shopping and a vibrant dining scene. In short, A-Ga-Ming is all about options…especially when it comes to exceptional golf.